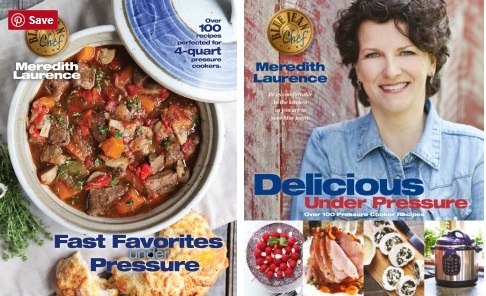 Meredith Laurence, the Blue Jean Chef, has worked in numerous capacities and settings in the food world. After graduating from the New England Culinary Institute, she first honed her skills in two Michelin-rated restaurants in Les-Baux-de-Provence, France. She then went on to work as a line cook at Zuni Café in San Francisco and at Café Rouge in Berkeley, California. She is the author of six cookbooks, selling over 650,000 copies, helping home cooks broaden their repertoire and become more versatile with a variety of cooking techniques in the kitchen. Her new book Air Fry Genius was released November 2017. I would like to think that I am best at caring for my family – my partner Annie, and my two dogs Ruby and Hazel. That is what is most important to me and I try very hard to be the best I can be with my family. I think dogs and other animals teach us a lot about kindness and compassion, so in my day-to-day life, I think my dogs remind me of what is really important. Their unconditional love keeps me grounded and allows me to bring my best self forward in my life. Their gratitude for every waking moment is a good reminder that I should be grateful for all of my moments too. I do always try to do my best at whatever I am doing and in saying that, I sometimes strive too hard for perfection. So my aspiration is to achieve balance in my life with the right amount of time and energy devoted to home and work. I would love to continue with the most meaningful aspects of my career while carving out more time for time with my family and my friends. I really hope to have more time to travel and see more of the world and different cuisines. These days, I am thinking a lot about my ‘currency’. When faced with any career decision, I often ask myself “is my currency money, time, or mojo - doing something I really love?’ These days, I am feeling a real pull to create more time for myself and hope that maybe that can be achieved while still doing something meaningful with my Blue Jean Chef brand that I really love. In recent years it might have been the publication of my first book with no prior experience. I self-published this book and created an amazing team of talented people to achieve this success. To this day, I still consider all of these people good friends and continued to use the same team for the next five cookbooks. I have had many challenging times in my career, from working as the only woman in a kitchen in a 3-star Michelin hotel in France, to trying to get a start in the food world in San Francisco arriving with just a few dollars to my name and the promise of a tryout at Zuni Café. Today my biggest challenge is finding time for my multifaceted career of writing books, creating videos, testing products, appearing on QVC and more recently by trying to manage the time-consuming demands of my website and all social media outlets, where I try to support home cooks in becoming more comfortable in their kitchens, all while continuing to build the Blue Jean Chef brand. My parents instilled in me a belief that I can do anything that I set my mind to. As a result I believe I CAN do anything if I work at it. That has been a real asset most of the time. Sometimes though, I have ventured into territory that might have been better left to the experts – like trying to work under the hood of my own website. In my career I have been so fortunate to work with impressive role models, including Judy Rodgers at Zuni Café. Judy always set the bar so high, paying attention to every minute detail. I think she knew we might not get to the goal she was setting for us, but even falling just short of her goal would have reached excellence. She never compromised. I am blessed with great friends. My best friend, Tanya and I have known each other for over 30 years. We have shared a lot over those years. We are both always there for one another, no matter what, and really are both so happy for each other’s successes. We hope for the best for each other. More generically, I have always loved music and really admire many musicians who make sacrifices for their art, working hard to express their creativity and passion. These days I’ve been particularly impressed by many young Canadian musicians who are trying to make a splash in a smaller pool. Rose Cousins, Jenn Grant, Leif Vollebekk. They are all amazing artists who have spent years getting to where they are today. My favorite places and destinations? I have to say that Newfoundland, Canada and Charlevoix, Quebec, in Canada are two places that keep calling me back. Both are destinations with breathtaking views and the people live life at a very different pace. I feel at peace there and cannot wait to get back. Sometimes I just need to get away to clear my head and reset – my favorite place to do that would be one of these two areas. In my work recently, I have really loved using the air fryer and sous vide circulator to enhance my cooking experience. I am a believer in both! In my life, I love my guitar and keyboard, although finding enough time for them these days has been a challenge. Music has always played a big part in my life. I go to bed listening to music and wake to it in the morning. Playing my own instruments is especially gratifying. I would have to say I love to eat and visit new restaurants or read about new food trends. For me, travel is always about experiencing the food of the region – what people feel represents their home and how it’s prepared. My other passions are my family and music. I love going to a great concert in a smaller venue. I love to follow and support up and coming musicians. Being Canadian, I love to attend the Festival of Small Halls every year and see great musicians in charming small halls. There is nothing like it. I love spending the everyday with my partner and our dogs. Our daily dog walks and our meal times always help me keep things in perspective. I know that my success comes from my happiness and being grounded in remembering what really matters in life.